The gloom in the eyes of the genteel EU folk in Brussels on Wednesday 9 November was a perfect reflection of the city’s rain-filled skies that morning. “The current tenant of the White House is the first Black President of the United States,” a colleague of mine quipped as I passed by his cubicle, “the guy we are getting now is a vulgar clownish buffoon, a Putin’s pal with hands on a nuclear switch.” As smart and talented as my colleague is, what escapes him as well as so many otherwise intelligent individuals of the “EU bubble” is the utter dissatisfaction of people with elites. It is quite natural that Western political, financial, economic and media elites do not see it, since they are the exact target of the brewing popular anger. To borrow the words of Alain de Benoist, demanding they accept themselves as the root cause of resurgent populism is same as putting in doubt their raison d’être. Being in “shock”, “despair”, or “dumbfounded” about uncouth Donald Trump does not help, however. It only serves to underscore the elites became smug and live in a self-centred bubble to which day-to-day reality does not penetrate. As non-Western media are too ready to point out, this lack of a capacity for self-reflection is a sign of political immaturity to which many Americans and Europeans have fallen. When I asked our editor Alice Máselníková for a comment, she aptly pointed out that elites pat themselves on the back and nurture each other with neoliberal convictions. They reject any different opinion immediately and without consideration as bigoted, racist, or extremist. If someone disagrees, so the logic goes, it must be only because they are not sufficiently educated or are not equipped with the right facts. If they were, “they would see through.“ Well, there you go, they did not. Now is the right moment to ask why. Being “dumbfounded” is not a good enough response, says Jonathan Pie and does not mince his words while doing it! Those who see hope in Trump and populism do not give a damn about all that mocking, eye rolling, crying emojis and emergency plans for emigration to far away lands. If there is something most human beings can agree on, it is that no one likes being treated as an idiot. Note well: Trump did not win regardless of his insensitive and direct utterances, but rather because of them. Pollsters who were putting Hillary Clinton in front of the race until the very last minute (as seen on the forecasts graph from New York Times) did not realise that people were quite likely hiding their political preferences because of fear of being blamed and shamed. Political correctness pushed the dialogue over ideology out of social discourse, to the extent a candidate who expressed himself vulgarly yet frankly, gave people the sense of choice and empowerment. Democracy is based on the idea that in civic matters, everyone is equal. If certain criteria such as the age of maturity are met, every citizen has something to contribute to the debate and decision-making. Our life experience is different, each of us fights own battles and is given personal opportunities. Each of us, therefore, is also a bearer of certain wisdom, which does not correlate with profession or the formal level of education. Only if we share our individual wisdom and put it to the scrutiny of others, we can hope to correct for errors and mistakes that are also individual. Czech thinker Petr Robejšek is correct in saying there is a powerful wisdom in the wisdom of the crowds, since a collective offsets excesses made by a single human being. For that reason, I have little doubt that Trump’s victory will be once written in history books as a fundamental moment of political change. Trump is the first President-elect in the 200-year old American history that did not hold any public or military function. Tremendous opposition from all traditional outlets of the mainstream notwithstanding, American people said no to the establishment and that after decades of electing sanitised and well-spoken presidential candidates who ended up offering zero palpable change. Obama was the last establishment candidate in whom people put their trust, only to see him put Citigroup and Goldman Sachs grandees on top posts in his Cabinet. Unsurprisingly, this betrayal had its political consequences: former Obama strongholds firmly sealed the election’s result when they turned to Trump. It is not so much Donald Trump who is the winner of this election, as the anti-establishment movement as such. In fact, history was already made when Trump became the Republican candidate and when Bernie Sanders made such an excellent performance during Democratic primaries. Someone for once addressed head on problems connected to immigration and globalised economy. The Trump phenomenon is about breaking the rule that some things should not be spoken about. As disgraceful as Trump’s comments about women or Muslims were, these kinds of words are heard by people everyday, be it among “their buddies”, in a supermarket, or at their work on a construction site. While the form may and should be certainly questioned, it remains clear that Trump spoke in an understandable language about topics that concern people on the street. Hillary Clinton and the establishment were certain they will have the White House. This witty video leaves them astonished as “mad dog” Donald snatches the coveted prize instead. It is a triumph of populism, albeit with Trump of a xenophobic kind. Populism, however, is not an ideology but a political style. It is also not synonymous with demagogy, as populists and elitists alike are perfectly capable of deceiving the people. Ernesto Laclau defines populism as a political disposition through which people constitute or reconstitute themselves as a historical actor, starting from the moment characterised by antagonistic plurality of views. Populism is thus fundamentally linked to democracy. In the US, such a moment is becoming increasingly visible as the clash between the establishment and its neoliberal ideology of globalisation, and forces that to various extent question such fundamentals. As the traditional dichotomy between political left and right increasingly loses importance, it is being replaced by the division between “up” (elites) and “down” (people). Trump represents the vulgar sort of populism and his political style managed to capture the anger of white working and middle-classes of the American Midwest. Formerly an industrial heartland of the United States, it was the area hardest hit by the outsourcing of jobs to cheaper locations in Asia. Wisconsin, Michigan, and Pennsylvania had not voted for a Republican candidate since the 1980s, and most polls showed Clinton ahead by comfortable margins in those states. Ohio went for Obama in the last two presidential elections, as did Iowa. Trump won them all. 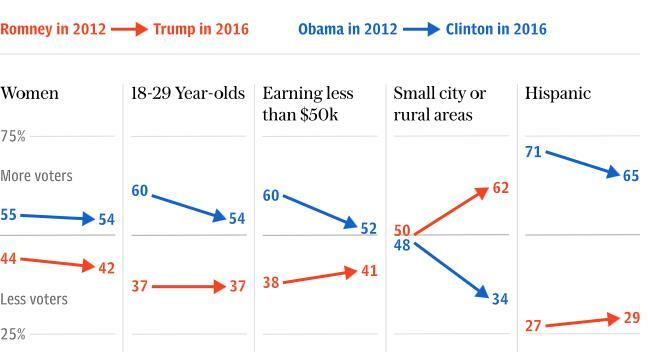 Changing social landscape due to influx of migrants, bursting of the housing bubble, and unaffordable education and healthcare that were not solved by any of the neoliberal “reformists” further added voters to the Trump camp. Vote for Trump meant a vote against Washington and against hollow moralising of corrupt elites that rely on their hold at institutions to push forward their own agenda. In one word against everything that the Clinton family symbolically represents. If Trump did not present himself as a xenophobe (as well as a misogynist) and appealed directly to African and Latin Americans of both sexes, his support would have been undoubtedly much higher still. Even then, as can be seen in the chart below, compared to Mitt Romney in 2012, his support among Hispanic voters increased by 2% to 29%. His highly antagonising rhetoric notwithstanding, he even gained some support among black voters, Jewish Americans or American Muslims. Entirely another question is if the controversial figure of Donald Trump can fulfil his voters expectations. For once, he never expressed his policy with any great clarity and there are some indications that his attitude might change when he enters the White House. While he reaffirmed his commitment to “build the wall with Mexico”, his tone during the victory speech was calm and conciliatory. His Cabinet is also likely to include some well-known establishment figures. He is also a “capitalist par excellence” and one cannot expect that the United States will turn on Wall Street, but this largely reflects the economically liberal nature of American populism. It remains to be seen to what extent Trump’s rejection of environmental policies, widespread deregulation, reducing corporate tax from 35% to 15%, or return to more private healthcare is capable of answering popular calls for a more just society. On the other hand, Trump offers some sympathetic policy proposals such as large-scale investments into infrastructure to secure jobs, an amnesty for the repatriation of big companies’ money from overseas, or protectionism against dumping prices of Chinese imports. All the above taken together, Trump and his team believe, should deliver a big fiscal stimulus to the American economy. The promise of higher investments were positively taken up by financial markets, which quickly jumped up from the initial “shock” of Trump’s victory, notwithstanding predictions to the contrary from such economists like Paul Krugman. And what about Europe? The European Union does what it knows best: on Sunday it organised another summit. This time it was a “panic dinner” where these political pygmies, so-called European leaders, struggled to find a response to a turnaround in American foreign policy. 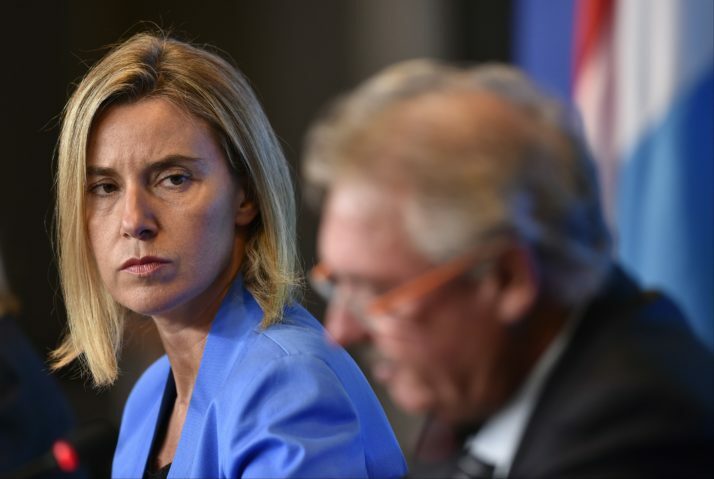 Rather than having a normal political reaction, the EU behaves like a company board that suddenly lost its CEO.The outcome of this meeting was predictable – the EU’s foreign policy chief Federica Morgherini issued a bland comment that “values, principles, interests” will continue to form the basis of the transatlantic partnership. European citizens, please translate: waste of your tax money. More interestingly, the meeting seemed to have been snubbed by the UK, France and Hungary. Financial Times reported that “British foreign secretary Boris Johnson dropped out of the Brussels meeting, with officials arguing that it created an air of panic, while French foreign minister Jean-Marc Ayrault instead opted to stay in Paris to meet the new UN secretary-general. Hungary’s foreign minister boycotted the meeting, [labelling] the response from some EU leaders as ‘hysterical’.” One is entitled to ask if the EU is showing first cracks in its façade. Meanwhile, Jean-Claude Juncker, President of the European Commission infamous for his drinking antics and former career stint in facilitating tax evasion as Luxembourg Prime Minister, wants to teach Trump “what Europe is and how Europe works”. Perhaps Mr Juncker should be reminded by his advisors that at least as far as Central Europe is concerned, Trump knows it better than him. His Czech ex-wife Ivana Trump is poised to become Ambassador to the Czech Republic and their children speak at least some level of Czech. What European politicians cannot process is that Donald Trump openly admitted that he would put “America First”, make reasonable deals with Russia’s Vladimir Putin, and fight alongside Bashar al Assad in Syria. In other words, he is completely reversing the decades of American liberal interventionism in global affairs. Since so many politicians in Europe made their career out of thoughtless pursuit of American political interests, it will be extremely interesting to see how they will react when they find themselves facing a President beating to a different tune. Merkel, Hollande, Juncker and others spent last several months insulting and lecturing Trump at every opportunity, yet now they will have to back down and sit with him at international summits. Also various sorts of media commentators and “think tanks” openly wished that Clinton took up the reins and continued the bellicose stance towards Russia that would have made the world at the very best an extremely unstable place. In this context it should not be forgotten that “the non-flying zone” in Syria proposed by Clinton would lead to a war with Russia. It is unlikely these organisations will change the tone as George Soros and others will continue in their hefty funding. Will they now advocate that Trump is overthrown, so that the promotion of the American liberal hegemony at gun barrel point may continue unrestrained? One should remain cautious about expecting (or fearing) too much from Trump, as he will be inevitably constrained by the Supreme Court as well as by Congress and powerful military-industrial complex. It also has to be noted that most of the Republican party does not support at all Trump’s realistic approach to international affairs. Especially through the figure of Mike Pence, future Vice-President, they will try to continue in the course of global interventionism. The great hope is that the change in American foreign policy may ultimately be good for Europe. Since European politicians completely showed the utter lack of capacity to promote Europe’s sovereignty and independence, Trump’s withdrawal of support for NATO might do it for them. The EU may be very well forced to rely on its own means for defence, which would be an ironic achievement after the decades that the Americans spent on undermining Europe’s efforts to do so. Last but not least, it becomes clear that liberal democracy with its focus on more of the same (political correctness, consumerism, corporate globalisation, disrespect for collective identities, preferential treatment of minorities to the problems of majority), does not offer solutions to social problems that we have also in Europe. The essential question is if the elites realise that and work together with people in solving their problems in a manner that is fully democratic, without demagogy and false promises, and just to all citizens without distinction. If they do not, and it would be due to their stupidity, greed and short-sightedness foremost, more and more extreme and extremist individuals will get elected into power also in Europe. Already in the 1990s American thinker Christopher Lasch spoke of the revolt of the elites, and that, I think, not the revolt of the people, is a fair assessment of the current situation. The final results of the Hungarian general election are out.